Local officials on Friday received a formal bid to run LUS worth $1.3 billion over 40 years from Bernhard Capital Partners’ newly created subsidiary NextGEN Utility Systems. The package includes $140 million in cash and $184 million in retired debt up front, and $920 million in in-lieu-of-tax payments and up to $64 million in shared profits over the contract’s lifetime. The direct payment of $388 million — i.e. the cash, debt relief and earn-outs — is a significant reduction from an earlier $526 million enterprise value set in a non-binding agreement the firm signed with Mayor-President Joel Robideaux in April. That agreement, which formally authorized Bernhard Capital Partners/NextGEN to assess LUS via a due diligence study, offered $246 million in cash, $216 million in debt relief and included the same $64 million in shared earn outs should LUS exceed revenue growth projections. The previous agreement did not address the ILOT payments already made by LUS, which in recent years have grown to a roughly $23 million annual payout to the city of Lafayette’s general fund. NextGEN’s $920 million in ILOT over 40 years is calculated by a percentage of estimated revenue, averaging out to roughly $23 million per year. That money would also be deposited in the city’s general fund, according to the proposal. 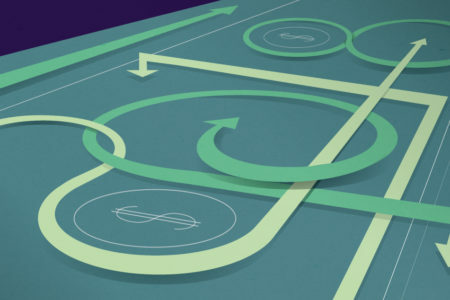 Increased capital expenditures and reduced revenue forecasts provided by LUS also account for the cheaper buyout. See the full proposal here. That earlier agreement included only the electric division of LUS. The official proposal, termed a cooperative endeavor agreement, includes management of all three LUS divisions: electric, water and wastewater. It states categorically that the arrangement is neither a sale or lease. 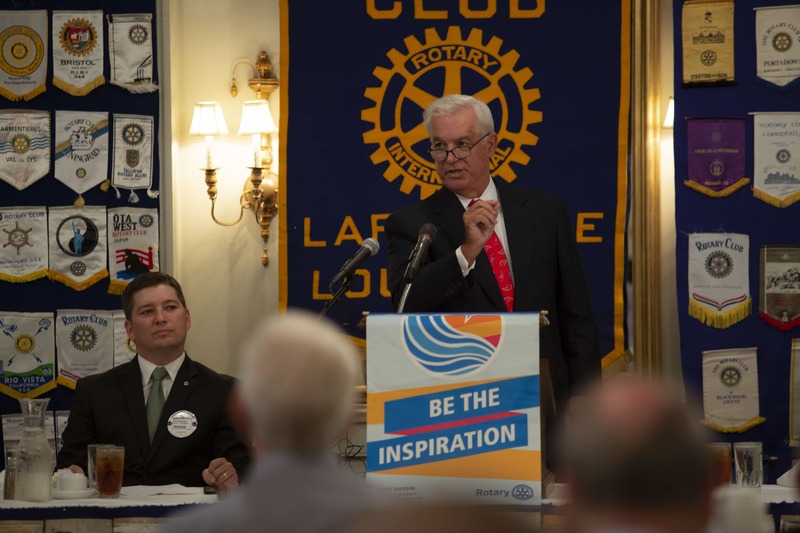 Jim Bernhard addressed the Lafayette Rotary Club in August. Billed as a $4.1 billion deal, the offer is heavy on assumed indirect impact, most of which results from the company’s “intent” to headquarter a utility management company called NextGEN. More than $2.8 billion in economic benefit is projected to be realized from job growth, including 400 jobs created at NextGEN, 250 indirect jobs and infrastructure growth spurred by the direct cash infusion. That estimate is derived from a brief economic impact assessment by LSU economist Jim Richardson attached to the proposal. The assessment carries the apparent endorsement of Lafayette Economic Development Authority, lending some local institutional support. “The Lafayette Economic Development Authority and Dr. Richardson agree that the collective economic benefits to Lafayette from NextGEN’s proposal amount to over $4.1 billion in nominal value and represent one of the largest single economic contributions to Lafayette by a private enterprise in the City’s long history,” the document states. Sweetening the deal is a 10 percent reduction in consumer utility rates locked in for three years. While rate changes would remain subject to the governing authority of the Lafayette Public Utilities Authority, a council sub-group that regulates LUS, the proposal suggests that rates could remain low over the long term as a result of system improvements. The proposal includes an overview of the due diligence assessment performed by Bernhard’s team over the summer. Bernhard’s assessment describes LUS as a suitable utility operation that performs its basic functions well, reliably and at a reasonable cost, but is nevertheless stuck in the past, handcuffed to bad capital investments and out of touch with innovations in energy production, particularly advances in clean energy. These sentiments echo criticisms of LUS made by local environmental groups for some time, particularly around LUS’s decision to re-invest in its coal plant in 2013. 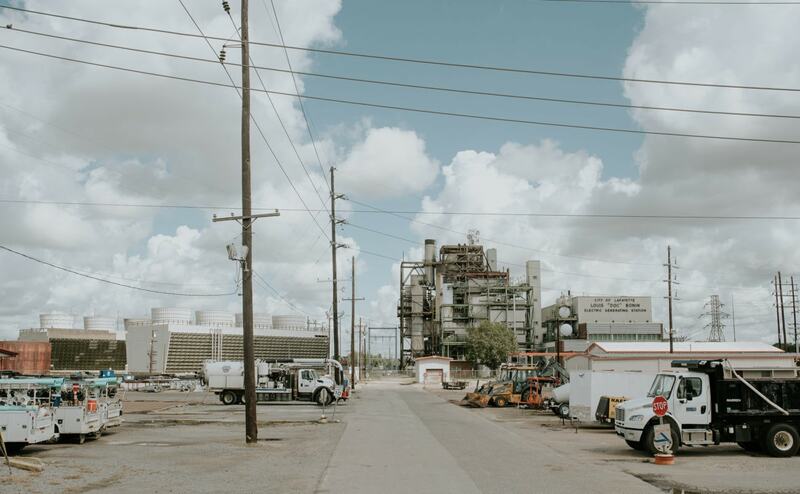 “The analysis and due diligence performed indicate that LUS’s electric, water and wastewater functions are not functioning at the level LUS customers and Lafayette residents assume and expect,” the proposal says. In making its case, NextGEN draws attention to key dramas around LUS that happened over the last year, notably while the company was in talks with the Robideaux administration. Email records indicate talks date as far back as 2017, when Robideaux signed a non-disclosure agreement with BCP to pursue a potential agreement for LUS. 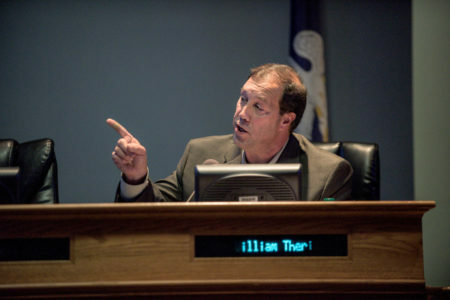 The assessment references former LUS Director Terry Huval’s retirement, the discovery of $1.7 million in erroneous payments by LUS to LUS Fiber, the electric division’s plans to build a new natural gas plant and an EPA administrative order to do a comprehensive audit and repair of the wastewater system. In local appearances, company principal Jim Bernhard has indicated NextGEN plans to acquire dozens of utilities around the Southeast, with Lafayette among the first, if not the very first. 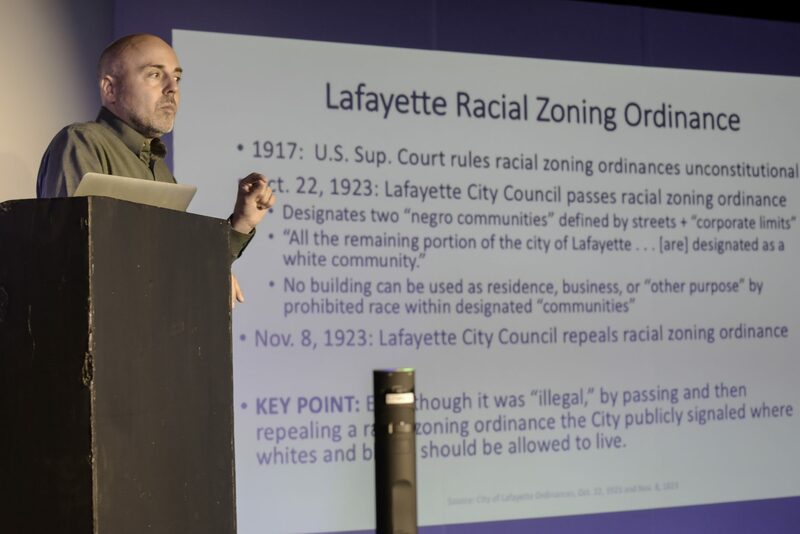 At one time, Lafayette was purported to have out-of-state competition to land the NextGEN headquarters, a key benefit highlighted in the package. Indeed, the company’s ambition is unprecedented according to the American Public Power Association, a trade association representing municipally owned power companies. Private companies have purchased only eight public utilities in last 10 years, according to Ursula Schryver, an APPA vice president. The association is watching the Bernhard deal closely. NextGEN has not yet released the names of its management team, although in its proposal the firm boasts senior management from top private utility companies. Indeed, the company is brand new and has no formal track record to speak of beyond Bernhard’s previous tenure as head of the Shaw Group, a massive engineering and contracting firm he sold in 2013. Still, the proposal argues the company’s superior management practices and protocols will improve on the existing LUS model. Bernhard Capital Partners is slated to present the proposal formally to a special meeting of the LPUA on Oct. 9, although plans for that meeting are reportedly up in the air. Both Bernhard and Robideaux have stated firmly that the transaction would be subject to public approval by general election, despite BCP’s production of a legal opinion suggesting that the nature of the agreement avoids legal requirements for a public vote in LCG’s charter. With big news at Waitr bookending our first year publishing, beginning with its blockbuster sale to a Texas billionaire and ending with CEO Chris Meaux ringing the Nasdaq bell, 2018 has been a year of extremes.